Boswellia papyrifera is a drought-resistant tree of Central and eastern Africa and a source of frankincense. 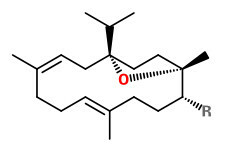 „The chemical composition of B.papyrifera is markedly different from that of other Boswellia…“ Main volatile compounds of B.payprifera detected by headspace SPME-GC/MS were n-octyl acetate (64.6%), octanol (13.9%), cembrene A (1.7%) and incensole (1.0%). These acids provide the very characteristic old churchlike endnote of the frankincense odor.